After an uninspiring start to senior football with River Plate in his native Argentina, Giovanni Simeone is slowly establishing himself as a player in his own right. The 23-year-old may not be a natural finisher like compatriots Mauro Icardi and Gonzalo Higuaín, but he is a combative striker that has inherited the work ethic that his father Diego had as a player. While “O Cañito” and “El Pipita” tend to do their best work in the penalty area, utilizing their lethal finishing to wreak havoc on opponents’ goals, “Cholito” is an all-action forward that does not mind getting outside of the box and doing the gritty work when necessary. Simeone has come a long way since making his competitive debut for River Plate in the Torneo Inicial in August 2013, a match which resulted in a 1-0 defeat to Gimnasia y Esgrima La Plata. After scoring a paltry four goals in 30 games in all competitions for Los Millonarios, he found form and confidence after moving to Banfield in 2014. Soon enough, European suitors took notice of the Argentine’s promise, and at 21, he transferred to Italian club Genoa, after scoring 12 goals in 34 matches for El Taladro. His stay with the Grifone was brief as well, scoring 12 goals in 35 Serie A matches throughout the 2016/17 campaign. Fiorentina acquired him from the Rossoblu in the summer of 2017 for €15 million, and the Argentine featured in every league game during the 2017/18 season, scoring 14 times and providing five assists. The most outstanding performance of that season for “Cholito” was in the 3-0 win at home to Napoli near the end of the campaign, where he scored a hat-trick and hammered the nail in the coffin to the Partenopei’s title challenge. Currently, the Gigliati have the youngest squad in Europe’s top five leagues, with an average age of 24.1 years. Simeone is a part of the reason why that number is so low, and he is currently forming a dangerous attacking trio with Italian starlet Federico Chiesa (20) and Croatian attacker Marko Pjaca (23). Although the trio are still taking time to gel properly, the three forwards are will develop a better understanding of one another with more experience. Statistics don’t truly reflect on the importance of Simeone to the Viola attack. He has scored just twice and provided one goal in eight Serie A games so far in 2018/19, but he remains an integral part to Stefano Pioli’s side due to his stamina, strength, determination, link-up play, and ability to apply pressure. 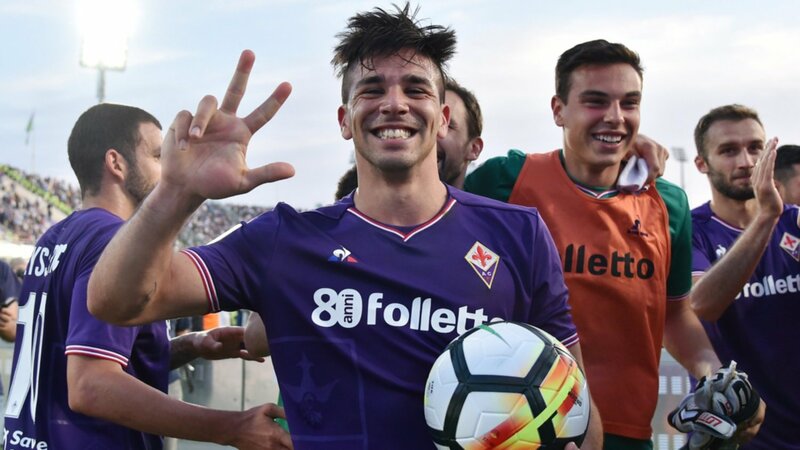 The Argentine scored a goal and created another in Fiorentina’s 6-1 victory against Chievo in its opening fixture for this season, a match that was attended by his father and Atlético Madrid tactician Diego “Cholo” Simeone. “Cholito” provided the cross for one of Marco Benassi’s goals with his non-preferred left foot, and he sealed the rout after exchanging passes with Valentin Eysseric. His next goal came in the rescheduled Serie A fixture against Sampdoria, as he opened the scoring in the 1-1 draw with a sublime diving header after Cristiano Biraghi delivered a curling cross from the left flank. The 23-year-old could have also scored prior to that goal, but his header from close range failed to hit the target. Due to his impressive form since arriving in Italy, Simeone has been selected for the senior squad of Argentina, which is currently going through a transition phase after the Albiceleste were eliminated in the Round of 16 of the 2018 World Cup by eventual winners France. The eccentric Jorge Sampaoli has been temporarily replaced by Lionel Scaloni, and the interim coach has decided to give opportunities to the new generation for the time being. As a youth international, Simeone found the back of the net 11 times in 13 internationals, and he earned his first two caps for Argentina in September. His debut came in a friendly against Guatemala and he scored one of the goals in the 3-0 victory. Although a few of the golden generation such as Higuaín, Lionel Messi, and Sergio Agüero have not officially announced their retirements, the tenure of Scaloni has given the likes of Simeone the chance to establish themselves in the squad and put pressure on experienced heads to regain their places. With the likes of Icardi, Lautaro Martínez, and Paulo Dybala in the current Argentina squad, “Cholito” will need to work hard for his opportunities, but he has demonstrated that he does not get overwhelmed by challenges or the idea of battling for things. Despite being the son of a famous footballer and coach, Giovanni Simeone has shown that he can determine his own destiny and become a respected player in his own right.